In the brightly lit aisles of Newman’s only grocery store you see miners in fluoro tops, trousers and boots, covered from head to toe in red dust. They walk through Woollies in a daze. Shifts at the mine are 12 hours, 6-6; the mine is open 365 days a year. Workers often work two days followed by two nights. The only time there’s traffic in town is just after six in the morning and just after six in the evening when the shifts swap over. In Woollies I also saw the beautiful bored wives of miners making small attempts to reign in their toddlers. These young families have moved here so they can make enough money for a down payment on a house in a city or a town more liveable than this. They may stay a year or two before moving on to another mining town; they may stay until their kids are in high school. During the boom some miners kept their families in Ubud in Bali and flew in and out of Indonesia. It’s relatively cheap there and the flight from Port Hedland to Bali is an hour and 52 minutes. The boom is over. It’s a transient place—especially now that the price of iron ore has dropped. Houses in Newman were being rented out for $2,000 a week, two years ago; now they’re $400. The caravan park used to be $200 a night, and it may still be, but we didn’t find out because we got to stay with Lee’s friend from Wales, who has a beautiful house and garden filled with frangipani and papaya trees in the front garden and chickens and veggies in the back. Our friend, Andrew, likes Newman. He frequently volunteers for St John’s Ambulance and he’s well-loved in town. Newman can reach temperatures of over 50 degrees in the summer months. There’s no cinema or bookstore. There’s no café, though they’re building one in the new shopping centre. They do have a library and recreational centre—sport is big here—and an oval and golf course. Radio Hill overlooks the town; it’s only small, but there’s a steep ascent and when Andrew was training to climb Everest last month, he’d hike up Radio Hill ten times in a row with a pack on his back. And there’s the beautiful pool that Andrew manages. It’s quiet in winter—we were the only ones swimming—because it’s too “cold”. It was 30 degrees outside and the pool temperature was 25. The town is cosmopolitan. There’s a Thai community, Pacific Islanders, Kiwis, Irish, Indians and of course the first people of this country. Some Aboriginals come down to town for a drink; they’re community, nearby, is dry. They wander slowly through the heat, gather in groups in the shade, sit on the grass and speak their native language. 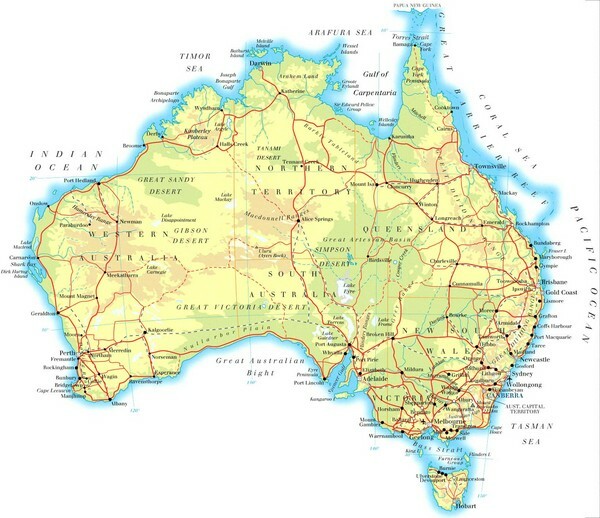 I wonder what they make of the massive hole in the middle of their country, and people like us passing through their country with a camper trailer. Newman is full of travellers this time of year. Some Aboriginals work in the mines, but they’re a minority. It’s much more common to meet a miner from New Zealand, some of whom are FIFO (fly in fly out). There’s a group of Aboriginals around the liquor store, “Cellarbrations”. Some leave their welfare cards with the cashier. There are a lot of other ethnicities frequenting the liquor store, too. Newman has three pubs (Lee went to one–$12 for a pint of One Fifty Lashes!). And three churches. Our friend tells us that they recently passed an ordinance here that Aboriginals are not allowed to buy alcohol after five p.m. But other ethnicities can purchase alcohol after five. I thought the days of different laws for different colours were over. You can see the temptation to sit around and drink in the tropics. It’s just so warm. And there’s so little to do (unless you’re Andrew, training for Everest by day and rescuing people in the ambulance by night). No one moves fast here, not even the miners. Newman is located 165 kilometres west of Jigalong, a place familiar to anyone who’s read Follow the Rabbit-proof Fence. If you haven’t read it, go out and buy a copy now. The girls in the book were from Jigalong. It’s the story of the most remarkable journey in Australian history. Three Aboriginal girls with white fathers and Aboriginal mothers were kidnapped and taken to a prison-like school just north of Perth, where they were trained to become domestic servants. Shortly after arriving, these three girls escaped the prison/school at Moore River and travelled on their own, by foot 2,400 kilometres home to Jigalong. They escaped numerous attempts to capture them. The story is both inspiring and heartbreaking. The post-script explains how one of the girls was abducted again by white authorities, as was her child. They were part of what is now known as the Stolen Generation. I find the journey of Molly, Daisy and Gracie especially remarkable when read alongside histories of early white explorers like Burke and Wills, grown men from a “civilized” culture, who had all the money and gear and no clue how to get through the middle of this rugged country. Many of them died before they were able to get home. These three indigenous girls whose story is told in Follow the Rabbit-proof Fence had more brains, knowledge of the land and stamina than most (if not all) of Australia’s famous male white explorers of the 19th century. R looking out at the massive cargo ships at Port Hedland, where the iron ore arrives from Newman, is loaded onto the ships and taken overseas. K and I went on a tour of the mine, which was remarkable. The pit used to be a mountain, Whaleback Mountain. “Pit” is a rather small word for the massive tiered crater dug out of red earth. The numbers are staggering when it comes to mining. We saw the tyres they use for the huge mining trucks–$40,000 a piece, and they only last nine months! Whaleback Mine is the largest open pit iron ore mine in the southern hemisphere. It’s mines like this that are responsible for Australia’s prosperity in recent decades. When I stood in the hot sun and looked down at the big trucks dwarfed by the size of this massive pit, I had mixed feelings. There are jobs and other financial, as well as practical benefits that come from the steel made from this mine. How many homes–apartments in high rises in Beijing and Shanghai–have been built from the iron ore that used to be Whaleback Mountain? I wondered if the steel in the foundation and floors of our own unit back in Sydney came from Whaleback? But I shuddered to think of the environmental impact of the mine–they use six million litres of diesel a month at Whaleback. Thanks for pointing out where you are on the map! You have covered so many miles now. This is a very thoughtful evocative post and I loved it.